Users access information using plain English. Instead of clicking on a screen, the user simply speaks or types. VerbalAccess enables users to use voice or text and reach the same API's currently called by your web or mobile app; See how. Most people don’t provide all the information required when they speak. VerbalAccess prompts for missing details and clarifies any ambiguity it detects. VerbalAccess extracts the information from the the customer approved transaction and sends it to the right API. As an example, in banking these would be API’s for viewing transactions by date range, making a payment, making a transfer between accounts or adding a payee. VerbalAccess summarizes the transaction verbally, seeking customer approval before submitting it to the back-end software. Output VerbalAccess clarifies and prompts for needed information. Messages sent to your mobile or web interfaces are displayed and spoken by VerbalAcces. app, so it can run into the authenticated environment. online interface, you speech or type enable your existing applications. VerbalAccess deflects a large percentage of calls made to a Contact Center, increasing live agent productivity and saving money. Customers no longer wait on the line – VerbalAccess increases customer satisfaction and retention. VerbalAccess is the future of the self-care customer experience. A personalized financial assistant built on top of VerbalAccess will appeal to millennial, connected customers in motion. They can text to VerbalAccess, or speak to it hands-off while driving or walking. SenseBased is an efficient search took for your customer facing website (non authenticated environment). 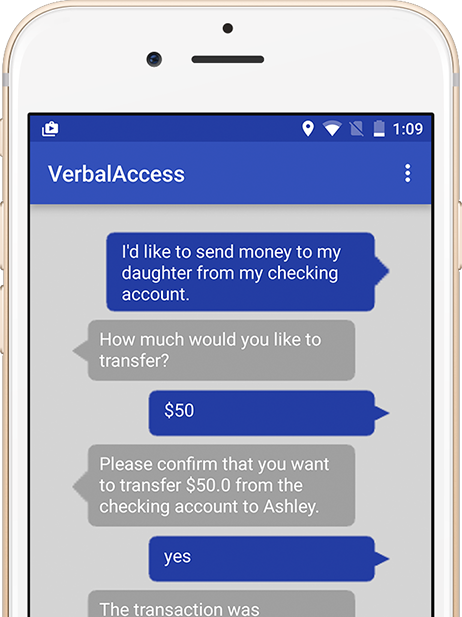 It can also be integrated with VerbalAccess to answer questions naturally occurring during conversation on a transaction. SenseBased can also be deployed on your internal intraweb, to easily find relevant information about product features, policies and procedures.